The company belonging to the Sorgent.e Group has been recognized as being the best hydroelectric power plant constructor by the Chilean association of electricity producers. 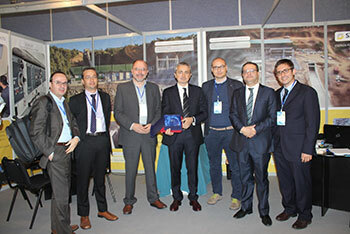 STE Energy, a company belonging to the Paduan Sorgent.e Group, has been awarded with the prestigious prize of “Expo Apemec 2014” as best hydroelectric power plant constructor with specialization in the mini-hydro sector. The award is sponsored by APEMEC, the Chilean association of Small and Medium hydroelectric power plants, the most important association of the sector in Latin America. The award organizing committee motivated it for “the exemplary commitment and the achievements gained by STE Energy, with the hope that this can constitute a source of inspiration among the players involved within the hydroelectric sector in order to best exploit the potential that this source of renewable energy can offer to the country’s energy system: 100 MW of clean, sustainable, competitive and safe energy”. 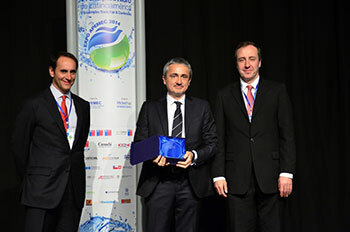 The award was given to Mario Arquilla, President of STE Energy, on Thursday June 19 in Santiago de Chile, within the exposition devoted to the mini hydro, Expo Apemec 2014, at the presence of the Chilean Minister of Energy, Máximo Pacheco. A recognition attesting the leadership of the Sorgent.e Group - which brings together more than 30 companies, among which STE Energy - within the hydroelectric field in Latin American countries, a geographical area with a huge potential within the field of renewable energies, where the Paduan group has already executed major operations. In Chile there are a number of projects developed by the company born in Padua. After the innovative projects of Mariposas and Lircay (financed by the World Bank since it was recognized as one of the most important projects, internationally, from the point of view of the social and ecological impact), Sorgent.e has been awarded a contract of more than 9 million dollars to execute its ninth plant in the Andean country, that is to say, the El Paso hydroelectric power plant, within the Colchagua province. Through its subsidiary company S.T.E. Energy, Sorgent.e is completing the revamping of the old Tacares hydroelectric power plant, on the river Poás in Costa Rica; the latest among more than 10 plants already executed by its technicians within the country. It dates back to April 2013 the agreement signed by Sorgent.e in Colombia which will lead to a joint venture with the local utility ISAGEN in order to jointly execute new hydroelectric power plants with unitary power lower than 30 MW conceived according to the mini-hydro technology, on which Sorgent.e is a globally recognized leader.